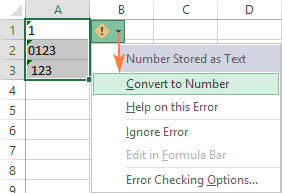 The tutorial shows many different ways to turn a string into a number in Excel: Convert to Number error checking option, formulas, mathematic operations, Paste Special, and more. Sometimes values in your Excel worksheets look like numbers, but they don't add up, don't multiply and produce errors in formulas. A common reason for this is numbers formatted as text. In many cases Microsoft Excel is smart enough to convert numerical strings imported from other programs to numbers automatically. But sometimes numbers are left formatted as text causing multiple issues in your spreadsheets. This tutorial will teach you how to convert strings to "true" numbers. Excel has an inbuilt error checking feature that alerts you about possible problems with cell values. This appears as a small green triangle in the top left corner of a cell. Selecting a cell with an error indicator displays a caution sign with the yellow exclamation point (please see the screenshot below). Put the mouse pointer over the sign, and Excel will inform you about the potential issue: The number in this cell is formatted as text or preceded by an apostrophe. If several cells are selected, the Status Bar shows Average, Count and SUM. If several cells are selected, the Status Bar only shows Count. The Number Format box displays the Text format (in many cases, but not always). There are a handful of different ways to change text to number of Excel. Below we will cover them all beginning with the fastest and easiest ones. If the easy techniques don't work for you, please don't get disheartened. There is no challenge that cannot be overcome. You will just have to try other ways. Select all the cells containing numbers formatted as text. Click the warning sign and select Convert to Number. Select the cells with text-formatted numbers. On the Home tab, in the Number group, choose General or Number from the Number Format drop-down list. Note. This method does not work in some scenarios. For example, if you apply the Text format to a cell, enter a number, and then change the cell format to Number, the cell will remain formatted as text. Compared to the previous techniques, this method of converting text to number requires a few more steps, but works almost 100% of time. Select the text-number cells and set their format to General as explained above. Copy a blank cell. For this, either select a cell and press Ctrl + C or right-click and choose Copy from the context menu. Select the cells you want to convert to numbers, right-click, and then click Paste Special. Alternatively, press the Ctrl + Alt + V shortcut. 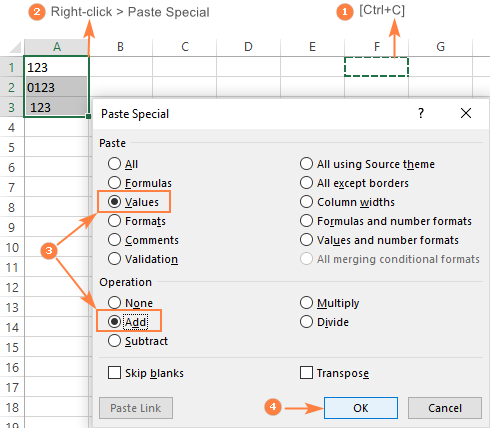 In the Paste Special dialog box, select Values under in the Paste section and Add in the Operation section. If done correctly, your values will change the alignment from left to right, meaning Excel now perceives them as numbers. Select the cells you'd like to convert to numbers, and make sure their format is set to General. Switch to the Data tab, Data Tools group, and click the Text to Columns button. 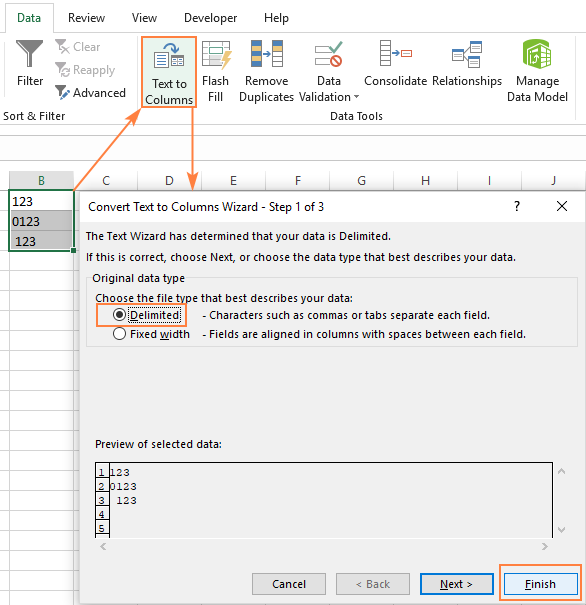 In step 1 of the Convert Text to Columns Wizard, select Delimited under Original data type, and click Finish. So far, we have discussed the built-in features that can be used to change text to number in Excel. In many situations, a conversion can be done even faster by using a formula. Microsoft Excel has a special function to convert a string to number - the VALUE function. The function accepts both a text string enclosed in quotation marks and a reference to a cell containing the text to be converted. The VALUE function can even recognize a number surrounded by some "extra" characters - it's what none of the previous methods can do. For more information, please see VALUE formula to convert text to number. Apart from text-numbers, the VALUE function can also convert dates represented by text strings. Where A2 contains a text-date. By default, a VALUE formula returns a serial number representing the date in the internal Excel system. For the result to appear as an actual date, you just have to apply the Date format to the formula cell. 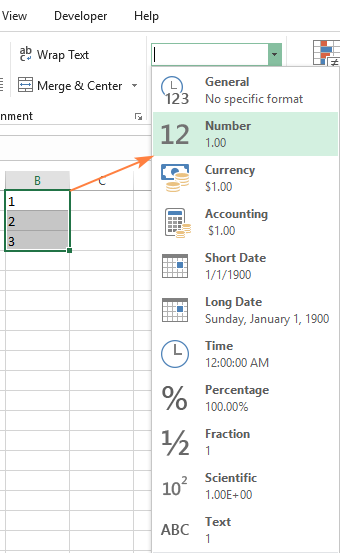 For more information, please see How to convert text to date in Excel. The VALUE function also comes in handy when you extract a number from a text string by using one of the Text functions such as LEFT, RIGHT and MID. If you don't wrap the RIGHT function into VALUE, the result will be returned as text, more precisely a numeric string, which makes any calculations with the extracted values impossible. 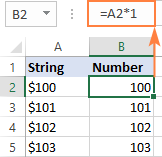 For more information, please see How to extract number from string in Excel. 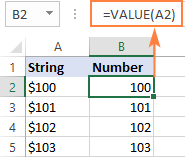 One more easy way to convert a text value to number in Excel is to perform a simple arithmetic operation that does not actually change the original value. What can that be? For example, adding a zero, multiplying or dividing by 1. If the original values are formatted as text, Excel may automatically apply the Text format to the results too. You may notice that by the left-aligned numbers in the formula cells. To fix this, be sure to set the General format for the formula cells. Tip. If you'd like to have the results as values, not formulas, use the Paste Special feature to replace formulas with their values. 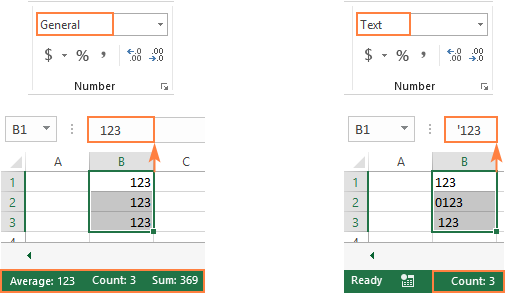 That's how you convert text to number in Excel with formulas and built-in features. I thank you for reading and hope to see you on our blog next week! 14 Responses to "How to convert text to number in Excel"
I want to add text data field in rows portion after Values field in excel pivot table. How can I do that? How to change a text into the number like we need to convert "Best" is equal to 5. You are amazing! Saved my day and future days as well!! Select "Delimited" and hit next. In the advanced box it asks for the decimals separator and for the thousands separator. Enter the separator you see on the screen (NOT the separator that you want). So in the above example you would put a comma as the thousands separator, and a full-stop as the decimal separator. My excel does not recognize the following as a value 2 027,60. I need a thousands separator to be a "," and decimal to be "." . I have a whole column of values that need to be converted. I have tried the substitute function which works on changing the decimal function for values less than a thousand, thereafter it does not work on a value of 1,000 or more. Thanks to you, column to text was causing excel to crash, this was the best solution since i am trying to automate the a script, that does just this. Thank you so much to this very helpful post. Thank you gurus of excel! The other problem might be that the 'System Separator' is not the same as your pasted value. I.e. In the cell you have value 100.22 In other words 100 point 22 or 100 decimal 22. If your File -> Options -> Advanced -> (About 16 lines down) Use system separator is ticked then the decimal point will make the field text - No matter what you do. To correct this, un-tick 'Use system separators' and ensure that 'Decimal separator' is a . and 'Thousands separator' is empty and not a blank.